Bex Driscoll scores the only try of the game. Bletchley Ladies scored a huge victory on Sunday, beating title rivals Olney 5-0 to extend their lead at the top the league. After a 2 minutes silence for Remembrance Day, Olney took the opening kick. Bletchley took the catch as the tackler came in, formed a ruck, then pushed up the pitch. Olney defended, then Bletchley passed the ball back to Rachael Taylor who kicked it to touch. 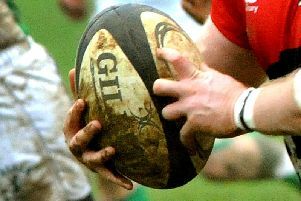 Olney held possession from the line out and came back at Bletchley. Both teams were obviously taking this match seriously. Bletchley dug in and stole the ball back and dropped a kick over the top, with Caroline Collie chasing the ball up the pitch to take the catch. Bletchley held possession through several rucks, then Olney took it back! They pushed towards the Bletchley line, then Bletchley gave away a penalty at the ruck, which Olney chose to take as a scrum. They passed out along the line from this, then gave a penalty which Bletchley also took as a scrum! They moved the ball back towards the Olney half, getting it to Rachael Taylor who kicked it up the pitch. Olney took the catch and came straight back at Bletchley, kicking the ball into Bletchley’s half. Despite a quick tap back over the approaching players, Bletchley couldn’t get to the ball and Olney pressed back again, putting pressure on the Bletchley line. Bletchley dug in and fiercely defended their line holding the opposition out. They managed to push them back towards the middle of the pitch, then Olney pushed back. This stale mate continued for the remainder of the first half, leaving the score sheet clean at half time. Bletchley made a few changes at half time, took the opening kick which was caught by Olney, who immediately applied the pressure and worked up the pitch. They took the opportunity to kick up the field, chasing the ball and taking the catch, only to find themselves on the receiving end of a hard tackle from Jennie Davies. She popped straight up and tackled again, gaining possession for her team. Sadly, this didn’t last long, with Bletchley giving a penalty at the next ruck, and the ball back to the visitors. Fortunately they almost immediately gave a forward pass and gave the ball back! Bletchley took possession just inside Olney’s half, passed along the line to Collie who took it to within 15m of Olney’s line before she was tackled out. Olney took the line out , but lost the ball at the breakdown. Bletchley put in a big drive towards the Olney line, forcing a penalty, which Rae Taylor kicked for touch. Bletchley took a short throw to Bex Driscoll who popped the ball out, only to have Olney steal it back! Olney gave away another penalty which gave Bletchley the opportunity to move back to the Olney half, then kicked to touch. Olney took full advantage and pushed back, kicking back deep into Bletchley’s portion of the pitch. In the chase for the ball, Bletchley’s Collie tripped an Olney player, gaining 10 minutes cooling off as a consequence! Despite their reduced numbers, Bletchley stepped up a gear at this. Olney had possession, trying to break Bletchley’s line, to no avail. Eventually they were forced into a knock on, giving Bletchley the ball. The Ladies put in two strong drives, then had a quick tap and go penalty to further advance them up the pitch. Olney were not 10, so Bletchley tapped the ball to touch and took the line out. They set up another drive, gained another penalty, which again Olney were not 10 for. Rae Taylor kicked down to within 10m of Olney’s line. Beth Metcalf took the line out cleanly and popped the ball down to Emma Taylor. She passed it out so Bletchley could set up another drive, pushing hard for the line. Now it was Bletchley’s turn to falter, first with handling, giving Olney the scrum, then a penalty. Olney opted to kick down the pitch, but didn’t make touch. Clare Stacey took the catch only to get a high tackle. As this was a repeated offence from the visitors the player was shown the yellow and it was Olney’s turn to be a player down. Taylor kicked the penalty ball back down the pitch, finding touch. A secure line out saw the ball pass from hand to hand, but Olney were not giving in and drove back at their opposition, pushing Bletchley away from the line. This forced Bletchley into a penalty for holding on, which Olney kicked to touch just 10m from the Bletchley line! However, the resulting line out wasn’t straight, reversing the honours. Turn and turn about. Bletchley held possession and formed a maul to drive forward. Olney dropped the maul. Bletchley took a quick tap and go penalty and worked up the pitch again. A couple of handling errors gave the ball back to Olney briefly, but Bletchley quickly stole it back again each time. Olney turned things over in a ruck near their line and kicked the ball, only to find Clare Stacey again who brought it straight back, passed it through the hands till Bletchley were back in sight of the line again. At 15m Olney gave away another penalty, giving Bletchley the push. Both teams fought hard on the line, but Olney conceded again. With a quick tap and go, Bletchley passed the ball to Bex Driscoll who powered it over the line in the corner: 5–0. The final quarter of an hour saw the stalemate return. Olney desperately tried to get down to Bletchley’s line to even the score, whilst their opposition were equally determined to keep them out, giving a final score of 5–0 to Bletchley Ladies. This puts the Ladies five points clear at the top of the table above Wellingborough, dropping Olney down to third place, though still with a match in hand.